That’s the name of a book I love that I bought in a used book store. It’s by Deborah Harding and was published by Reader’s Digest in 1998. 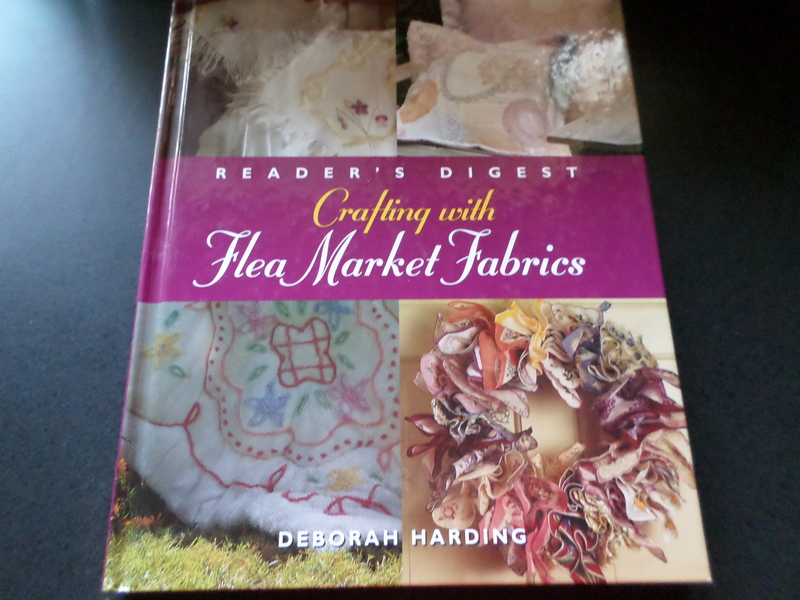 Flea market is the term that is used, but this applies to fabrics bought at estate sales (a great source), yard sales, thrift stores, and even items stored in your own linen closet or garage. I was reminded of this book after browsing in antique shops. If you have these items, what do you do with them? A lot of times, they’re just stored away and not enjoyed. Some things, like an antique quilt, you wouldn’t want to cut up, but what about partially stained linens or part of a tattered quilt? What if a beautifully embroidered dresser scarf you have is just not your style? 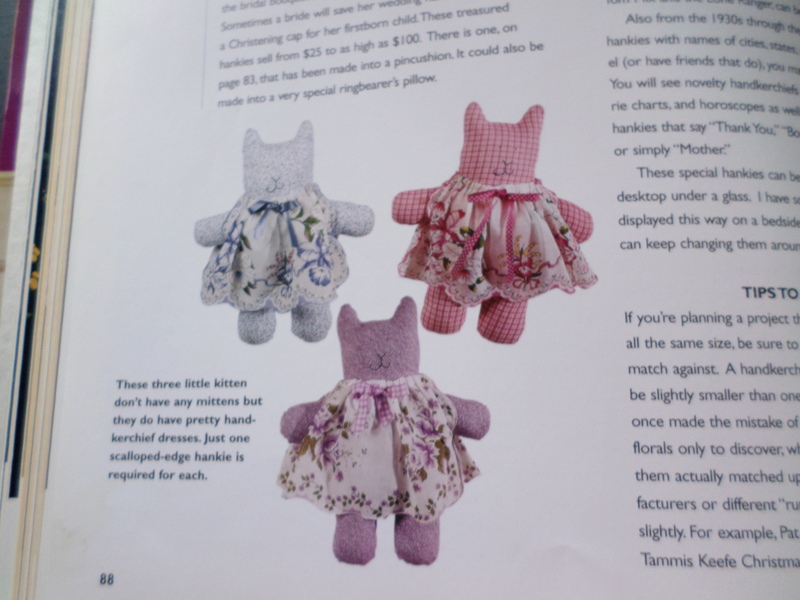 The book has ideas of ways to adapt these items for everyday use instead of just saving them. 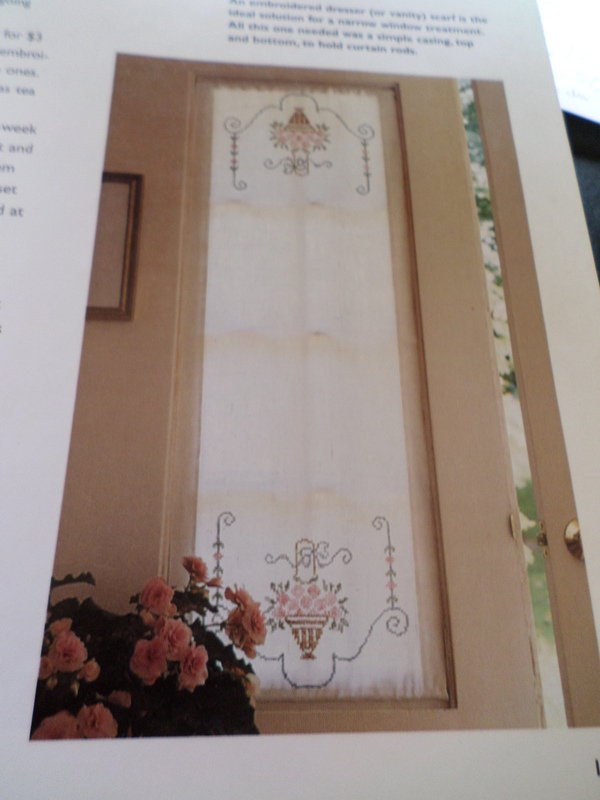 The chapters of the book contain projects for embroidered linens, chenille, quilts, lace trims, handkerchiefs, kitchen linens, and doilies. 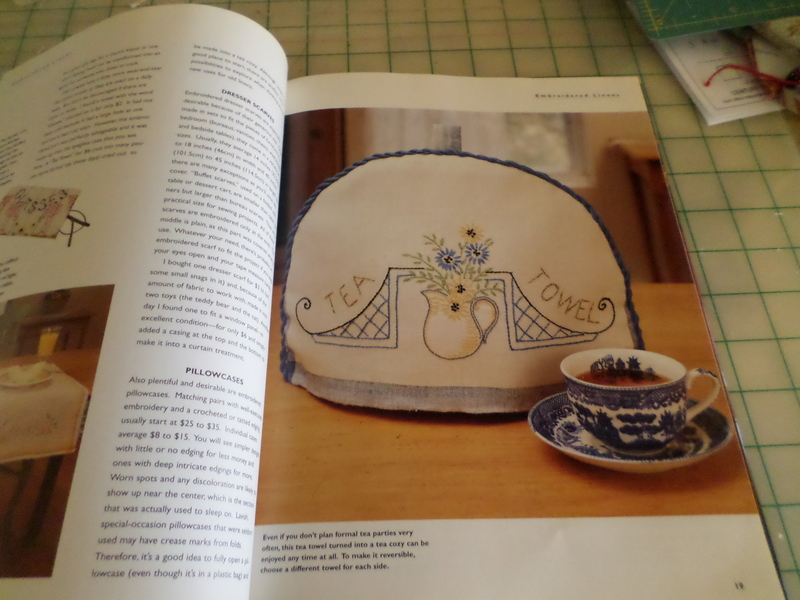 and an embroidered tea towel made into a tea or toaster cozy. 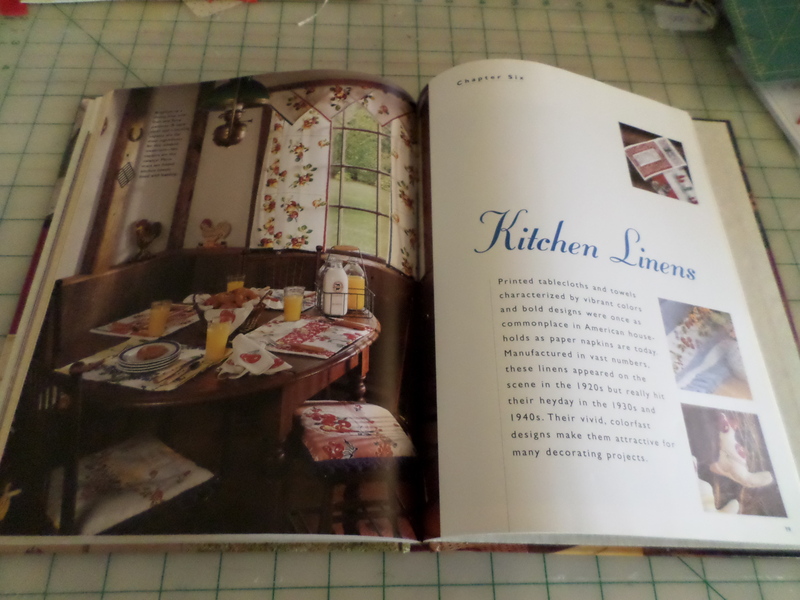 Look at all the beautiful things vintage kitchen linens were made into in this photo: curtains, placemats, chair seats, and napkins. So charming! Besides the projects, the book has interesting information about the history of and collecting the subject item of each chapter. 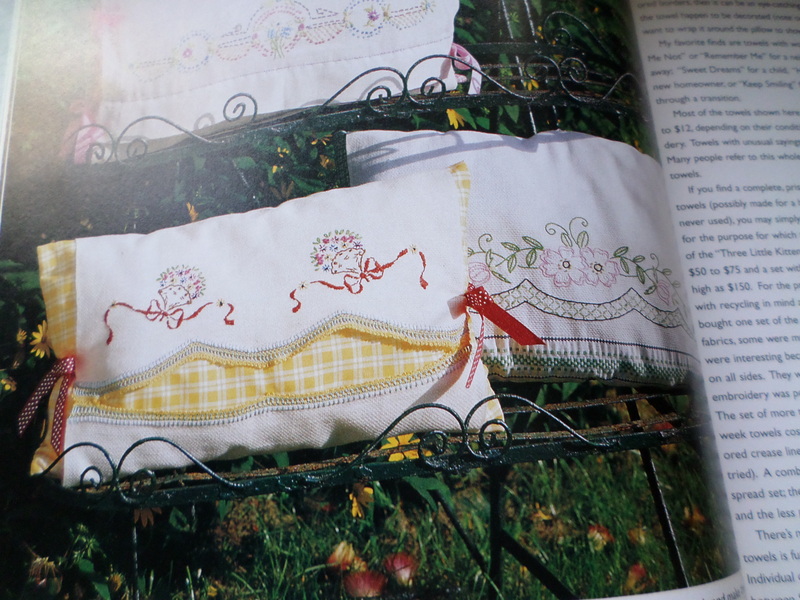 One project I found on Pinterest from Karoline of Cherished*Vintage uses vintage tablecloths and embroidered pillowcases to make wire coat hanger slipcovers. So pretty! The always creative refashion blogger, Beth, of The Renegade Seamstress, made a gorgeous dress out of a vintage Vera tablecloth. How stunning! What is your view on these vintage fabrics: store away, use, or repurpose? 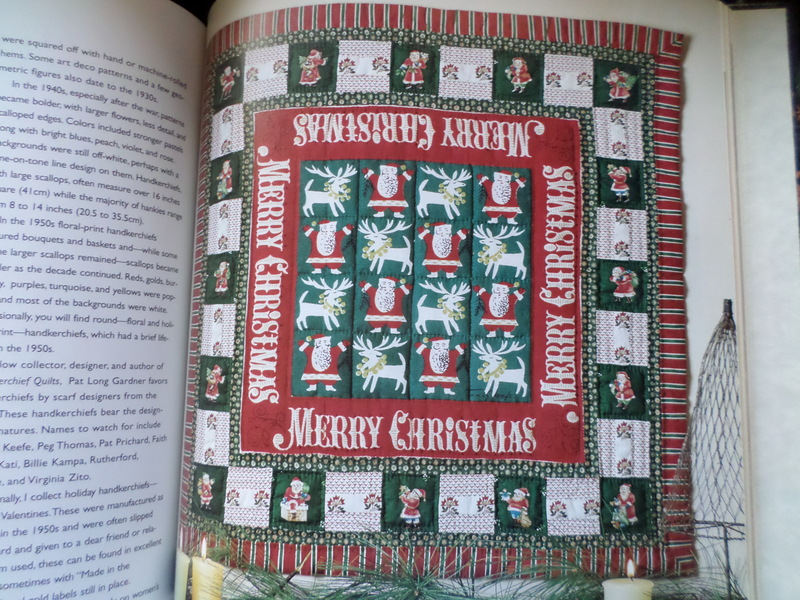 Do you have a project you have made with pieces of a quilt, tablecloth, or other vintage item? This entry was posted in Books, Looking Back and tagged Crafting with Flea Market Fabrics, Deborah Harding, embroidered linens, flea market finds, kitchen linens, projects for embroidered linens, projects for vintage fabrics, repurposing vintage linens, vintage linens on September 28, 2013 by Stitch It Again. 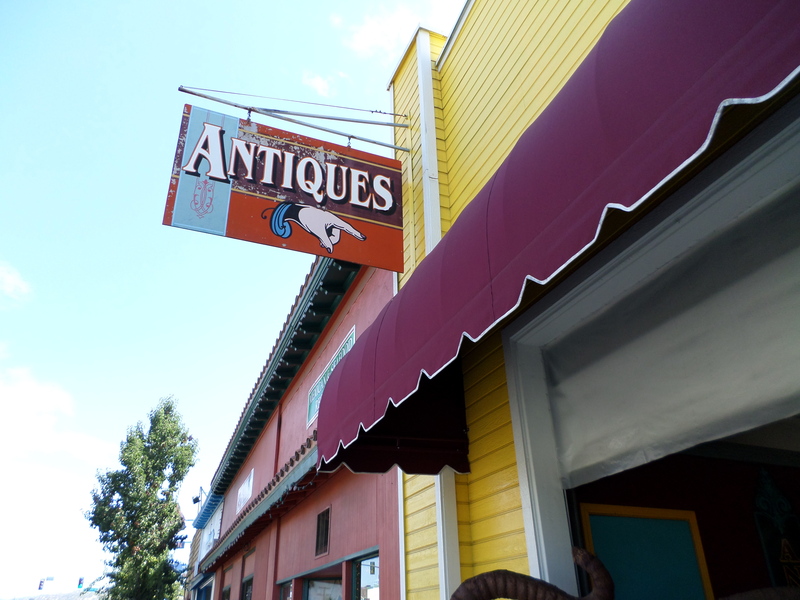 Over the Labor Day weekend I browsed through several of the many antique stores in the rural town of Ramona, California. 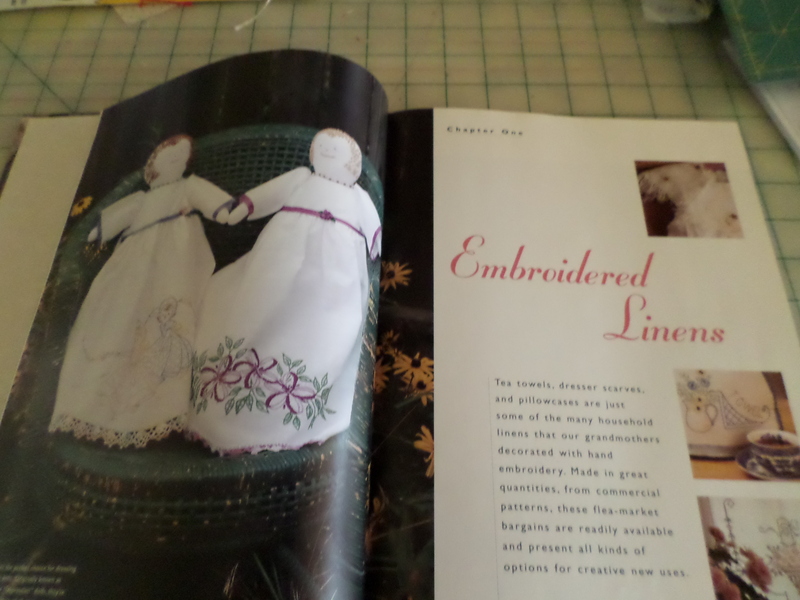 I enjoy looking at vintage embroidered linens and kitchen items, sewing things, childhood things, old books, and just about anything. It’s like exploring someone’s attic or garage for old treasures. buttons prettily displayed, and wooden spools standing in a wooden case. 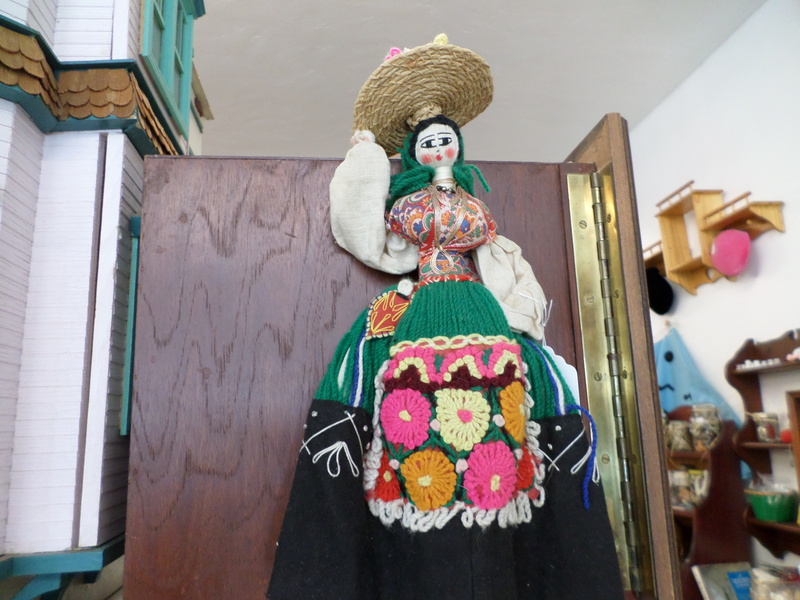 I love Portuguese yarn dolls – this one has a lovely apron. 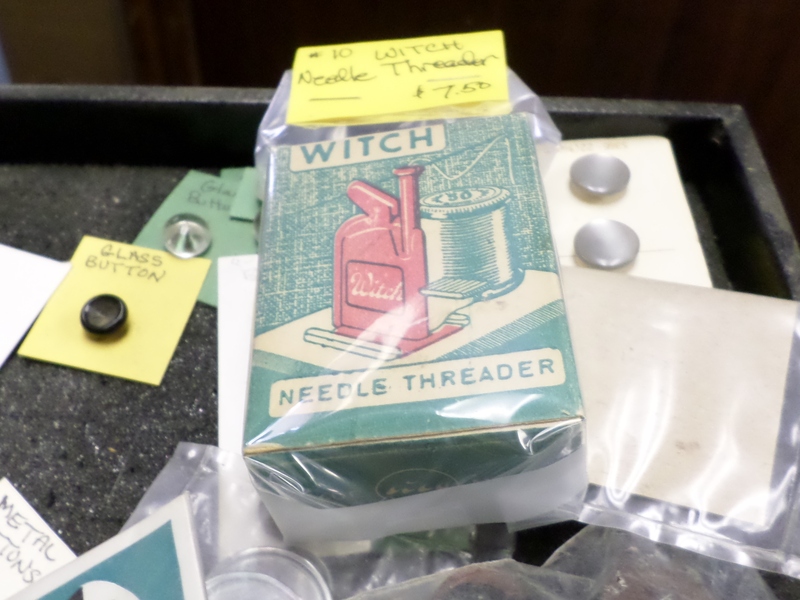 My mother had one of these Witch Needle Threaders made in Germany. Why don’t they make these anymore? They’re so easy to use – with a press of a lever the needle is threaded. 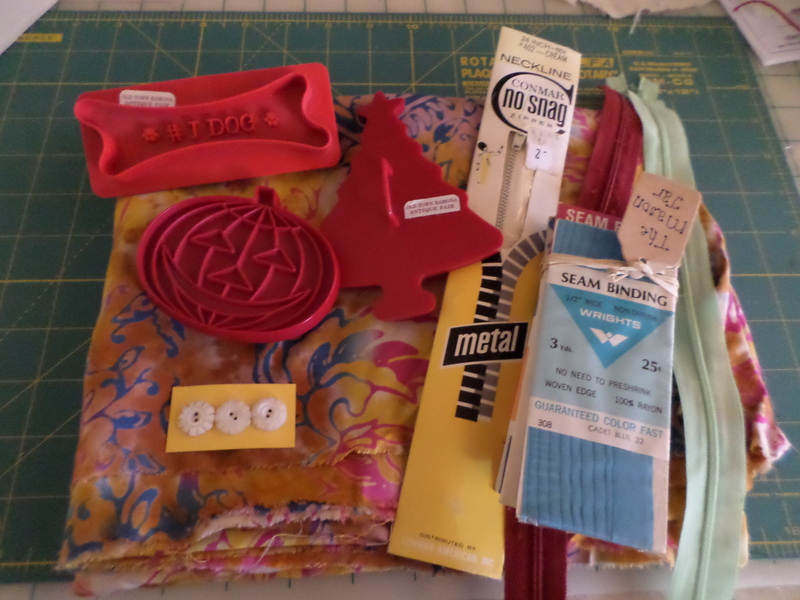 Only a few of the finds came home with me: “vintage” rayon fabric, notions, and cookie cutters. I love the little shell buttons with the notches. So pretty! 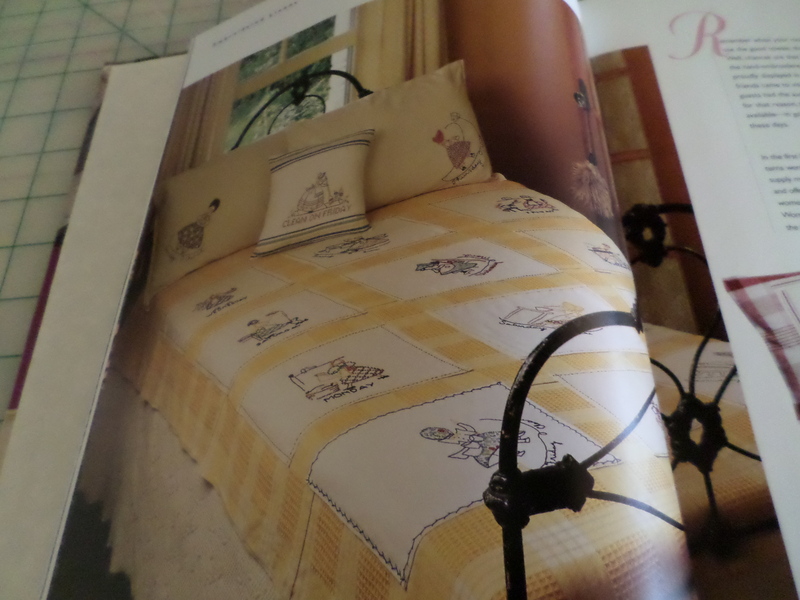 This entry was posted in Looking Back and tagged antique stores, embroidered linens, Ramona California, vintage linens, vintage notions, witch needle threader on September 14, 2013 by Stitch It Again.